Tight soils repel water and cause runoff which can induce plant stress, reduce crop yield & quality and affect the performance of nutrients and soil-applied chemistries. To address these issues, growers often increase the amount of water applied to the crop, reducing their return on investment. 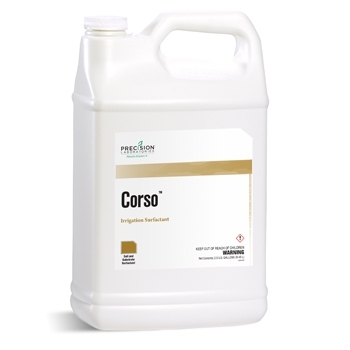 Corso is a unique formulation of two surfactants that reduce the surface tension of irrigation water and one surfactant that holds plant-available water. This formulation allows Corso to improve the movement of water into and throughout the soil and to hold water for the plant to use during periods of drought. Initial application 1 quart per acre. subsequent applications 1 pint per acre every 3 to 4 weeks.